The Crafty Thinker: Stephanie Fischer - Independent Stampin' Up Demonstrator: Retirement "card"
Packing memories into a retirement "card"
One of my team members at the office is retiring soon, so I decided to make her something more special than a normal retirement card. 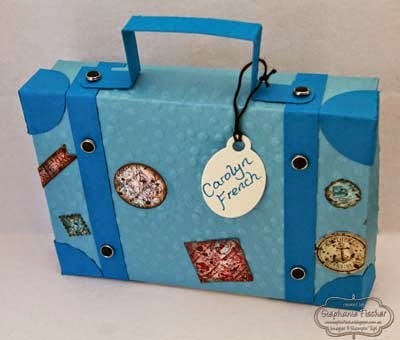 This little suitcase or briefcase (it could be either really) contains a collection of photos taken during her time with the company. 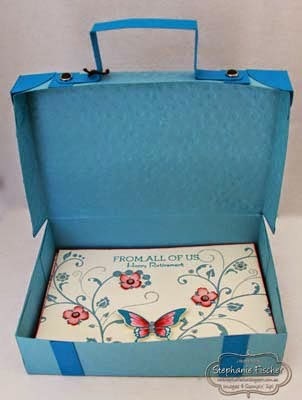 Also inside the case, there is a decorated card, individualised with a portrait photo, for each team member on which they will write their farewell messages. The very first thing she will see when she opens the case is a stamped card wishing her a happy retirement from all of us. The case is really a pizza-type box that I sized to suit the photos I wanted to include. The decorations are based on the image in the Traveller stamp set and some ideas gleaned from a variety of samples that I have seen. There are a few things I would change next time but overall I'm happy. 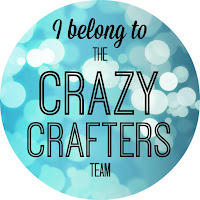 I have entered this case into the Splitcoaststampers May Scrapbook & More Focus challenge (CCREW0515SF) the topic of which is going away, moving, some kind of "going/motion" and could be construed as retirement. Remember to include the code 0515SF in your Key Words. So many goodies are retiring from the annual catalogue at the moment!